How US presidential election affect fragile Singapore and World stock market? China market is slowing down and almost all the analysts think China is heading for a collapse. Will it affect Singapore market? And what is the potential impact if US interest rate increase? - How you can prevent huge loss before a real big crash from stock market ? - What should be the strategies now for current market condition ? - How to hugely profit from the bear market? - What Singapore and foreign stocks that are good and worth to watch out before you miss the boat? - How to get rid of your emotion using mechanical trading system ? Free Seminar: What are the cheap and fundamental strong Stocks you may look at for 4Q2015? As STI falls dramatically to 2750, some strong fundamental stocks are looking really cheap now. If you believe in Warren Buffet philosophy to be greedy when others are fearful, this is the right time to do a bit of homework to find out the strong fundamental stocks and prepare. 1) What are the good fundamental stocks you can watch out for in 4Q 2015? 2) How do you spot a stock that is good fundamentally? Did Najib just print RM20b money for the stock market?!?! 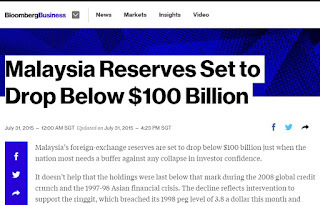 I wonder how the malaysian government is going to cough up the RM20b for the stock market. 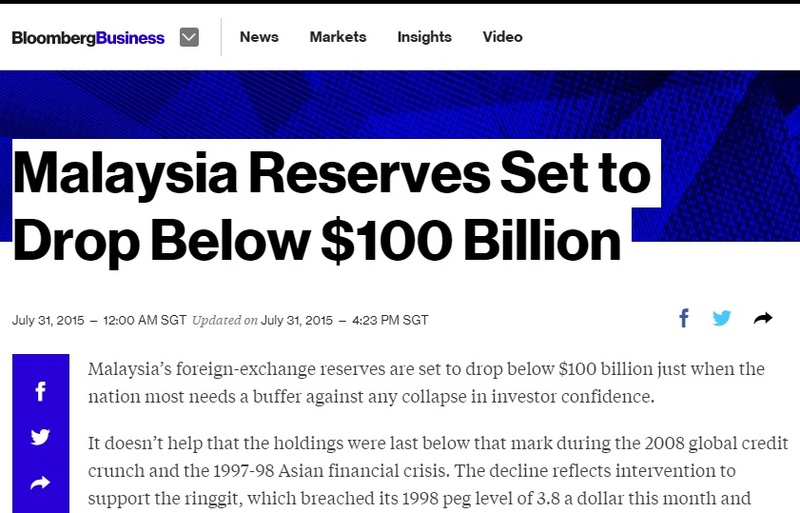 With reserves dropping below $100billion as reported by bloomberg (below), it sure looks like malaysia government is "printing" the money just like what US, Europe, Japan and China did these few years. But the problem is that Ringgit is already plunging crazily. Now the currency is 1USD to 4.35 Ringgit. With this printing of money, ringgit will continue to drop against the USD. The extra funds, although is good for the stock market and economy, it is bad for the ringgit. Don't be alarmed if you see 1USD : 5 Ringgit if the government really adopts such a loose economic monetary policy now! The problem with malaysia is that it is a small country. Being a small country, printing money never solves the problem. It will only lead to hyper inflation and currency depreciation. Recently Janet Yellen, the FED chairwoman announced not to increase interest rate due to concerns over China and the emerging market. Malaysia, being one of the emerging countries, is perhaps the first to declare a "fund injection" a.k.a printing money, to save the stock market. I do not know if other emerging markets will follow suit. Hopefully not! If not, I do foresee an Asian Financial crisis happening again. Currency might be attacked like what happened in 1997! FREE Seminar by Daniel Loh: Is the stock market already in a BEAR Market? The whole world stock market has gone crazy. Almost all the indices have dropped 20-30% in the last few months. STI has dropped nearly 21%. From my survey and meetup with many investors recently, there are more people who believe we are already in a bear market than those that believe we are still in a bull. Are most of these investors right?? Is this the start of a bear? 2) How is the stock market going to be like after interest rate rise? 3) Is the hot money still in the stock market? 4) How do you save your stocks now???? ?